QDPX allows you to transfer projects between QDA software packages and move freely between different platforms. We are very happy to introduce this feature on the very day it is officially introduced by the Rotterdam Exchange Format Initiative (REFI). - We are also extremely proud to announce that on the same day, too, we are releasing the new version 8.4 for both Windows and Mac which-along with QDPX--contains a great many new features and functionalities and features. And v.8.4 is free for all ATLAS.ti 8 license holders! For any feedback and questions, we look forward to hearing from you! What do you think about ATLAS.ti? Are there any features that you wish the software had? Your suggestions and ideas are invaluable, because we strive to provide the most sophisticated and powerful analysis tools for qualitative researchers everywhere - including you! Please take 5-10 minutes to share your feedback by completing this survey. 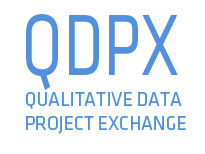 The new QDPX standard allows you to transfer projects in full between different QDA software packages. You are no longer confined to a single software product but can move freely between platforms. 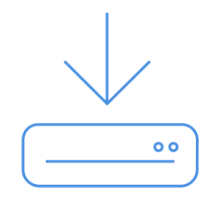 ATLAS.ti has championed universal data exchange since 2004 and is proud to announce that it supports the new QDPX standard literally from DAY ONE! Starting March 18, license holders of ATLAS.ti 8 can update their installation for free to service pack v.8.4 which implements full QDPX import and export. We release ATLAS.ti 8.4 Windows and Mac on March 18, the same day the new QDPX format is officially introduced by the Rotterdam Exchange Format Initiative (REFI). This underscores not only our commitment to this exchange standard but also our long-standing support for open and universal data formats. 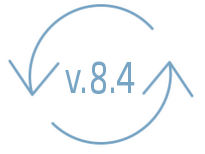 But version 8.4 offers a whole lot more than the implementation of QDPX. We have added significant new functionality to the Project Explorer, to multiple managers, and to the various Analysis tools. You can now create groups from anywhere (including the Network editor), create new exports to various statistical programs, and generate new reports with powerful new features. And MUCH, MUCH more! Note: ATLAS.ti 8.4 is a FREE UPGRADE for all ATLAS.ti 8 license holders. - Be sure to update as soon as possible by running the Live Update. Quiere aprender cómo utilizar ATLAS.ti, ¿pero no tiene la disponibilidad para venir a un curso? ¡No se preocupe! Estamos aquí para ayudar a todos para realizar sus análisis cualitativos con más facilidad y rigor, lo que nos ha motivado para crear un curso asincrónico E-learning: 20 video clases, con diapositivas, tests, y ejercicios, con acceso durante 30 días. Tras completar el curso, recibirá un certificado oficial de ATLAS.ti, y - lo más importante de todo - ¡tendrá los conocimientos para utilizar ATLAS.ti en cualquier de sus investigaciones cualitativas! Pinche aquí para más información e inscripción. As ATLAS.ti Cloud grows with exciting new features, so too does our help center: Enjoy our brand-new video tutorials! We have created a short video tutorial covering every aspect of working with ATLAS.ti Cloud. Our help center offers all the resources you need to learn to take full advantage of ATLAS.ti Cloud, and if you ever have any questions or doubts, count on our live chat support! 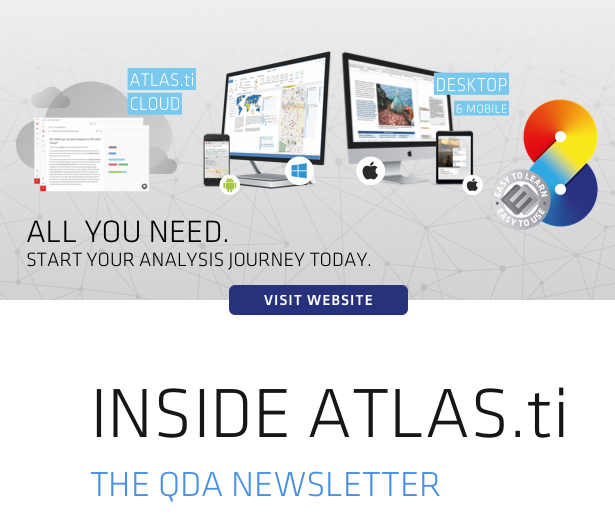 ATLAS.ti Cloud is the brand-new, fully web-based version of the powerful qualitative data analysis software. 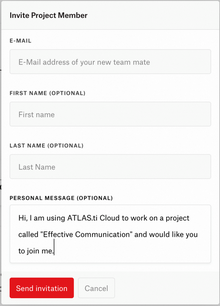 Now that you can analyze your qualitative data online, conducting teamwork is easier than ever with ATLAS.ti Cloud's live collaboration features. Multiple people can work together on the same project in real time, and ATLAS.ti will keep track of who did what. 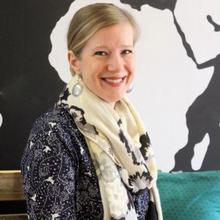 In this case study, we have the pleasure of presenting our interview with Dr. Nicole Claasen, a senior lecturer at AUTHeR (Africa Unit for Transdisciplinary Health Research) at the North-West University in Potchefstroom, South Africa. Dr. Claasen is involved as a Principal Investigator in numerous research projects related to sustainable diets, food security and food systems in South Africa.